Tea has played an even more important role in my life over the last couple of weeks. I am totally exhausted and depleted most of the time, and have made it all a go with strong tea in the morning, a packed thermos of strong black tea front-loaded with sugar, a large coffee on the way to work, a coffee at work in between my thermos imbibement and a coffee on the way home if I am feeling too sleepy to drive safely. When I am in required driving moments, Karagöz just tries to screech punk rock lyrics in my ear to keep me awake with his favorite from that 1980s band Suicidal Tendencies “Institutionalized! I’m not crazy, you’re the one that’s crazy, institutionalized! I went to your schools, your churches, and you call me crazy? Institutionalized” (See the full lyrics here, it’s a hoot). I’m not sure why Karagöz focuses on this one – he probably just remember the words and it is something to shout instead of swerving into cars. In order to try to get him to stop the high-pitched tone, I tell him all about straight edge punk as it played out in the New England suburbs in the 1980s – drug free, politicized suburban kids rejecting the status quo as much as possible. I tell myself stories about the straight edge punks I knew at that time to keep myself awake. I remember how I did not embrace that movement as I wished I might have. Sobering thoughts such as this keep me a bit more awake. 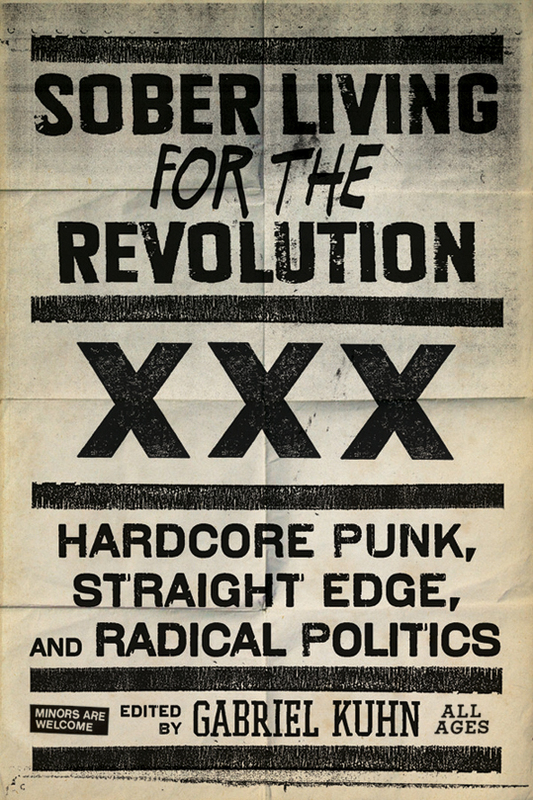 Sign for a straight edge show - punk rock in the 1980s - never cease, never desist! Hacivad, meanwhile, takes another approach to keeping me awake on the long drive home. He rolls down the window in the hope that a blast of constant fresh air will wake me up and cure the ills of my punk rock infused eardrums. The little ladies pinch my arms to keep me on my toes. They don’t care much about mixed metaphors. M. calls me and Hacivad re-interprets his calls to “just come home” in Rumi’s words “I know you’re tired but come, this is the way.” Of course, Rumi is talking about the way of love, the way of the Sufi. And in a sense, well, I am heading home to the love of my family, so it makes sense. Hacivad likes to interpret EVERYTHING through the sayings of the Mevlana Rumi. No suicidal tendencies lyrics for him. Eventually, I make it home, and usually crawl right into bed, no dinner. M. and I are still trying to get to the bottom of why I am still so tired. Hacivad says, no wonder! M. is worried, a doting husband in this regard. He tells me to eat bloody, red steak. I want no part in it. He tells me that I may be anemic. We’ll see what the blood test says. I remember when I was a kid and I had some sort of problem this way – my mother had to eliminate her “tofu no meatballs” and “soy product surprise casseroles” in favor of her pre-hippie times hamburgers. Even the thought of these crazed-sounding, offbeat vegetarian delights of the 1970s send the little ladies of the dancing chorus into confused huddles and result in uproarious roaring and laughing on the part of Karagöz himself.As for me – I am happy to forget some of the worst vegetarian exploration dinners I had growing up – but I am still trying to find the perfect, bottomless thermos for my tea infusions. As long as I am home near the stove, the little lady shadow puppet dancing troupe likes nothing more than ferrying tiny glasses of tea my way, passing them one to another in a string of cooperation spanning from the kitchen, through the foyer and into my green bedroom. I usually do them a favor and reach down to the floor to pick up the tiny glass of tea without spilling, as climbing the matelasse bedclothes would likely be a bother. I often see that these ladies feel truly called to serve – born to serve – and serve tea often and always. These little ladies, they start the day by sending one of their representatives up the bedclothes, onto the black nightstand and over the pillow to whisper into my groggy ear ““Do you want demli çay ( strong tea) or açık çay (weak/light tea)?” Then when the chain of tea cooperation results in warm tea in my hand, I often here them cluck-clucking and saying “tavşan kanı çay” (tahv-shahn kah-nuh chai) As I really don’t know all that many words in Turkish – I just thank them formally and nevermind. Eventually, the tea wends its way to my brain and my legs feel like moving and I can get up and get along with my day. 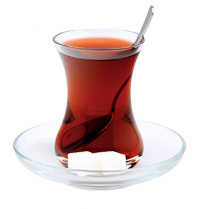 This weekend, we had our dear friend’s son staying with us, and it was in the process of making him some tea one morning that I finally learned the meaning of “tavşan kanı çay.” As I delivered the slender glass, both M. and our guest exclaimed “tavşan kanı!” and after seeing my confused and bemused face – said “oh – right – rabbit’s blood. We call it rabbit’s blood when it is brewed deep like this.” Ah, so that’s what the heck it is. Hmm. Check. Pleased to be asked to pour a second glass, I had the distinct sense that all of my Turkish tea-making and Turkish tea-making observations over the last few weeks may indeed finally be paying off – I may finally be an acceptable tea-maker in the realm of the Turks in my life. This is a major form of mastering cross-cultural marriage with a Turk, I have decided. M. often makes the tea, but there are moments where it is mine to make. You may remember our tea-making challenge on my first trip to Bozcaada, click here to read that. Whenever I have made the tea, it has pretty much always been too light, or I have used a too-strange tea leaf (say, assam, with rose petals?) but these days, I am going straight for the Rize Cayi from the Black Sea region of Turkey – not even taking our Teyze’s practice of mixing one part Rize tea and one part Earl Grey tea. Mastering the art of tea-making for the future production of the happy sound of tiny steel spoons clinking against crystal glasses, that’s a wonderful moment for me, I’ll cook rabbit’s blood anyday. I love when I fit in a little bit more as the American in the Turkish territory of a Turkish-American marriage. This entry was posted in Turkish Food! and tagged etiquette, Karagöz and Hacivat, New England, tea, Turkey, Turkish, Turkish tea. Bookmark the permalink. Hmmmm! I detect the gradual, if groggy, emergence of the butterfly from the fogs of ‘spindizzy’. Long may it continue – well, not too long, let’s have you fully fit soon. Meanwhile what’s all that about ‘rejecting the Status Quo’? Let me tell you, there is nothing like the Quo – best rock band ever! Once saw an interview with a Quo ‘head-banger’ who was asked about the practice of standing right next to those spectacular arrays of loudspeakers – ‘Yeah! Well; sometimes it feels as though yer brains is cummin out ov yer nostaws; but it’s great, innit?’ (spoken like someone with a severe speech impediment combined with a severe head-cold) Remember, these were the days before Health and Safety Regulations put a stop to people having a load of harmless fun! I love your Rabbit’s Blood tea and your Karagoz danclng ladies….I wish I had them bringing tea to my bed in the morning. I jump start my day with a Caffe’ Latte and some biscotti but your system seems far more romantic. Thanks so much, Trisha. I think we need to find some Italian folk characters to live in your mind and give you some insights into how to manage the few recesses of Italian culture that you haven’t figured out or mastered – and of course to deliver you some bedside strong espresso!! !